-It’s killing season in TV land this week. 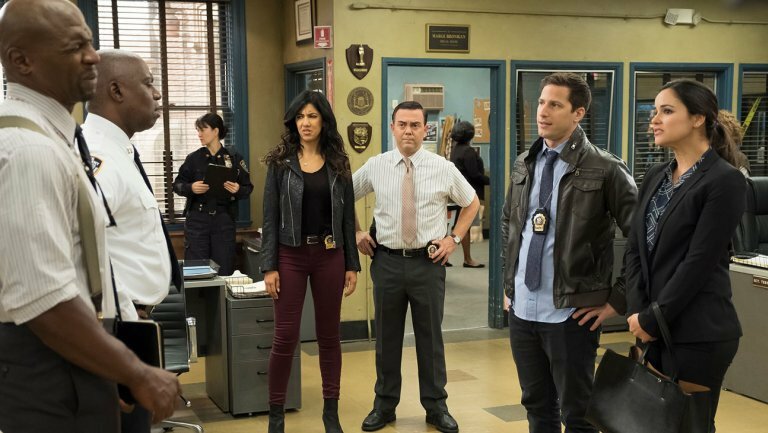 Fox just canned Brooklyn Nine-Nine (nooo!!! ), The Mick and Last Man on Earth — but weirdly, they have room for a dumb Tim Allen sitcom. They still haven’t announced the fate of Lethal Weapon (I’m still shook about how bad an actor’s behaviour must have been to get thrown off a show the network wanted to renew. Actors behaving badly is the norm, so it must have been REALLY bad). Over on NBC, Law & Order: SVU, Blindspot and the Chicago shows will survive but there’s still no word on Timeless. -I don’t know why Chris Hemsworth and Chris Pratt did a couples photo shoot, but I’m not complaining. –Amal Clooney was so worried her Met Gala dress would rip, she changed in the gift shop. Seems like a lot of work for a not-great dress. -So we’re in full Georgina Chapman comeback mode, right? First Scarlett Johannson wears Marchesa to the Met gaga, and now Vogue is giving her a soft-focus profile. –Ariana Grande and Mac Miller have split after nearly two years of dating. -People keep trying to put Justin Theroux and Emma Stone together. I’m going to continue to cling to a blind item I read that said she had no interest in dating him. I’m CLINGING to it! -Hey Sylvester Stallone, your racism is showing. –Jennifer Garner made a music video about being a mom for Ellen. I don’t get it. –Jennifer Lopez and Jimmy Fallon faced off in a fast dance dance off! -In an interview with Lana Del Rey for Elle, Kendall Jenner says it was “weird” when her younger sister had a baby before her. –Chris Brown is being accused of hosting a party at his L.A. home where a woman claims she was repeatedly raped by two of his friends. -Spotify has removed R. Kelly music from its playlists, citing new hate content and hateful conduct policy. Now Sony and RCA need to drop Kelly from its roster. -I really, really don’t want Roseanne to attempt to do a #MeToo episode. -I kind of love that Jessica Chastain is walking the walk. She’s producing and starring in 355, a female spy movie with Penélope Cruz, Marion Cotillard, Lupita N’yongo and Fan Bingbing. -Watch Deadpool apologize to David Beckham for insulting his voice in the first movie. -I love this: Patty Jenkins may earn nine times her Wonder Woman salary for the sequel, according to Variety. -I guess I’m in the minority but I really enjoyed I Feel Pretty. Greta Gerwig did not. -Watch John Cho‘s frantic hunt for his missing daughter in the first Searching trailer, also starring Debra Messing.